Is your van more than 5 years old? Still have the original tyres? Here is important information you need to know about the dangers of "old" tyres; (not really that old, besides, the tread is still like new...) Click HERE for an informative website and a couple of videos Sean cane's testimony (video) is illuminating. Bridgestone Australia website. 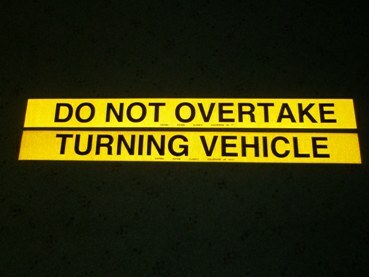 "Do Not Overtake Turning Vehicle" Self adhesive signs are now available from our club. Scraping your tail on a driveway? Your van fridge not working properly on 12v? lane on the right of the far left lane. "(Source: Heavy Vehicle Drivers' Handbook, published by RTA, NSW) The same idea applies to right hand turns. This is a privilege allowed to caravans as well. If you use more than one lane and do not have this sign, then there can be issues with the law enforcement agencies (especially if said agent has had a bad day.) There is also some protection with insurance if you are unfortunate enough to "make contact with another vehicle" when turning. The signs are available from trucking suppliers. If you use screws to fit the sign, remember to seal the screw hole with some silicone to prevent a leak into the van. We have reflective, self adhesive signs available for $12, courtesy of our Caravan Association. See Ben for details. Scraping the back stays of your van on driveways? "Twice during our trip the rear stabilizers of our van hit the driveway as we came out of garages. In fact the driver's side stabiliser was bent up & the spare wheel also scraped the drive. The spare wheel is mounted lower than the rear bumper. "Since returning home I have fitted a cast iron wheel that is welded on to the chassis with a couple of brackets (both sides). The wheel is about 10mm lower than the stabilizer & slightly to the rear. Thus, if the rear of the van scrapes the driveway again, it will hopefully run on the wheels and not damage anything. The cast iron wheels are available from Reflex. 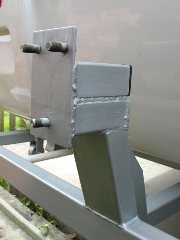 "The mounting bracket for the spare wheel has been raised up about 50mm with a section of steel chassis. The bottom of the spare wheel is now flush with the bottom of the bumper. "We trust this idea may be helpful for other Club members. A timely reminder to all members to drain their water lines & HWS in Shower Toilet Model vans during the Winter Months. This will avoid an expensive repair should a cold snap/frost freeze the waterlines HWS. In the winter months, owners of Shower Toilet Vans who live in cooler climates should be vigilant in regard to cold weather and frosts. In the event of water freezing in your van water lines, the damage bill can be enormous, hence the following is advised. Drain excess water from your water lines by means of turning off the water pump, turn on all internal taps partially, and then the external tap on the drawbar. This action allows some water to siphon out of your lines and should residual water freeze, it is no longer under pressure, hence it is less likely to cause damage to your water lines. Now, switch off your HWS (if it is on). Locate your HWS release valve located externally under your van close to the HWS. (Note: The HWS needs to be cold to avoid scalding yourself. If the HWS is hot, let it cool before attempting the following). Activate the release valve by hinging the lever back and leave it released. Some water will run down your arm. Next, open your HWS door and activate the release valve at the top of your tank. Water should flow out the lower release valve. You could completely empty the HWS this way. However all you need do is drain a portion off to allow for expansion in the event the HWS freezes. Now, let the top release valve return to it's normal position. You have done as much as you can to avoid damage to your water lines. Do not turn your HWS on again until you fill it with water. (Stick a reminder on the switch) To refill, climb back under the van and let the release valve return to it's normal position. Turn off all taps again, including the external drawbar tap, with the exception of the Hot Tap over the sink. Apply water to the system by external source or turn on the water pump and pump water from your tanks into the system. When you get an even flow at the tap with no air, it is safe to activate your HWS. Check all parts of your water system for leaks. If you discover a leak, cut the water supply and have it fixed prior to causing water damage to your pride and joy. An occasional drip from the HWS release valve is normal, as the water expands under heat and the valve is doing it's job. Regards to all, Ian Weal. Isn't it true that we all carry our mobile phones with hundreds of names/numbers stored in the memory but nobody other than ourselves knows which of these numbers belong to our near and dear ones? Let us for a moment create a scenario wherein we are involved in an accident or had a heart attack and the people attending us get hold of our mobile phone but don't know which number to call to inform our family members. Yes, there are hundreds of numbers stored but which one is the contact person in case of an emergency? For this reason, we must have one or more telephone numbers stored under the name ICE (In Case of Emergency) in our mobile phones. The concept of "ICE" is catching up quickly. It is a simple and important method of contact during emergency situations. As mobile phones are carried by majority of the population, all you need to do is store the number of a contact person or person who should be contacted at during emergency as "ICE" (meaning In Case of Emergency). The idea was thought up by a paramedic who found that when they went to the scenes of accidents, there were always mobile phones with patients, but they didn't know which number to call. He therefore thought that it would be a good idea if there was a nationally recognized name for this purpose. Following a disaster in London , the East Anglican Ambulance Service has launched a national "In Case of Emergency (ICE)" campaign. In an emergency situation, Emergency Service personnel and hospital staff wouldthen be able to quickly contact your next of kin by simply dialing the number stored as "ICE". Fridge not working as well as expected on 12v? Well…. There are many experts in this matter. I’m not one of them. Discussion with club members and personal experience has prompted this article on vehicle and van wiring. The following is an amateur’s telling of what is needed. I’ll leave the technical details to the others. If you understand what is needed you can either do it yourself, or find a sparky that is willing to listen, advise you, and get the job done so everything works properly. My personal experience is that the wiring on your vehicle is less than ideal unless you ask for the appropriate (heavier) wiring. The wire for the fridge wasn’t even connected on my 4WD’s plug! No wonder the fridge got warm when travelling! Well clever me put a bridge between the Anderson Plug and the fridge wire, and then wondered why my house battery was going bananas! (There was feedback through the Anderson Plug when the motor was off!) The diode was, well, who the hell put it there??? *#@ID10T*## I now have two diodes; I guess the other one does a job. My fridge works a beaut now and my house battery is happy again. As a minimum, you need to ensure that you have at least 6mm (preferably 9mm) wiring from your battery to the van. Make sure you have a battery isolator at the vehicle battery end so you don’t end up with a flat car battery. An automatic electronic battery isolator only cost about $160 and even I was able to install one. They switch on when your car battery reaches operating voltage and switch off when the engine is stopped. Easy. An Anderson Plug is preferable to using the 7 or 12 pin connector that connects the tow vehicle wiring powering the fridge in the van. This heavy duty wiring should then be continued to the fridge. You can also use this wire to charge the house battery on your van, but make sure that you have a serious sized diode in the line to prevent your house battery from running your fridge (and killing your house battery) when you are stopped. Get the diode from your Coromal dealer (about $35) because auto electricians don’t have big enough diodes (from my experience). The wiring provided as original equipment will do the job, just. It may be adequate in temperate climates, but hot weather will really test your fridge. It will probably only be running at 50 - 70% on original wiring. Follow the principles described above, along with the more technical info in the links below, or have your friendly Coromal dealer rectify the wiring to get your fridge working as it was designed. Whilst I worked at Burgess, an infrequent complaint was made about the double bed frame. You see, the timber used to pinch upon itself creating a lot of friction, hence a high pitched squeak. This noise could prove embarrassing when moving around in the bed, and when couples did want to move around in the bed, if you get my drift, everyone in the van park knew about "rhythmic squeaking." Should your bed suffer from this ailment there is a super quick fix: talcum powder. Yes you hinge the bed frame up, sprinkle talcum powder all over every piece of exposed timber, shut the bed down and have a good roll around. Tilt the bed back up and remove excess powder. Done. Ah! Silence is golden, golden, and my work is done. Oh, it smells nice too. Frank's Hint. Get two lengths of 100mm pvc pipe, cap one end and fit a screw top on the other. Drill several 19mm holes in the capped end and one about every metre in a row length ways. 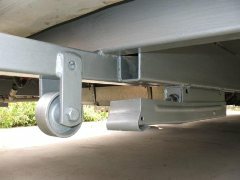 Fit the pipes alongside the chassis from the back of the caravan and sit the front end on the axle with the holes downward. I use one of these for my water hose which is folded and the other for my drainage hose which is cut just shorter than the pipe. Each section is fitted with a joiner and you just use what you need. Stops leakage into storage compartments and the airflow dries them out.